I always try to provide some information on my blog which I have learned recently. 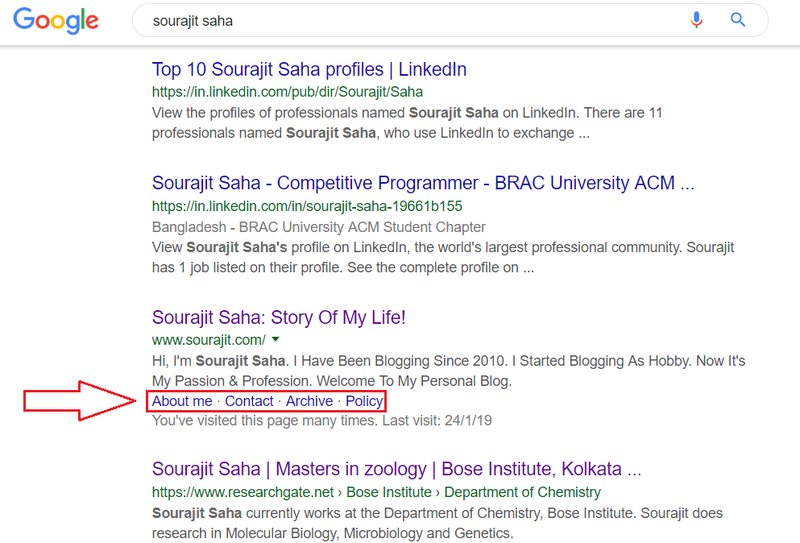 for example, I was reading about Google's featured snippet from Shoutmeloud, and Neil Patel, I immediately post about this issue. And search engine optimization is a thing that has been changed a lot than it was ten years ago. Google is getting smarter day by day. As a result of that, some of my spammy blogs have been affected as it's not white hat SEO. It's 2019, and I made my first blog in 2010. So, after nine years, I can feel, I did not know about blogging at that time. It was purely a desire to make money, and for that reason, I made my first blog. Purchasing a new domain is exciting, but purchasing a domain of your own name is much more exciting. And when you are working on it every single day, when you are trying to provide more data to your blog reader. Google will consider your blog as valuable. A few days ago, I wrote an article about my blog on the search engine. And I was a little bit upset as the way Google is treating my blog. When you are continuously working for it, and you don't get as you want in return. It will make you upset. 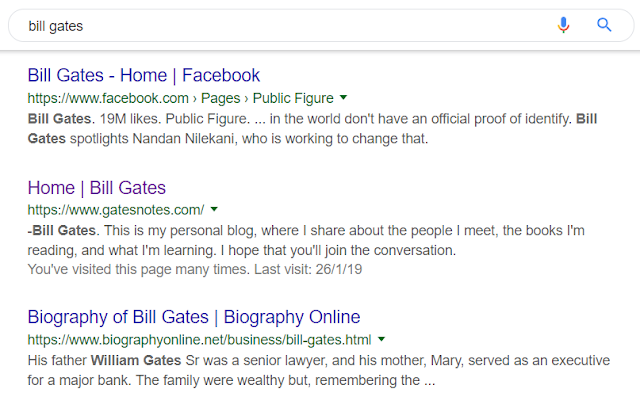 Bing and Yahoo search result is quite impressive to me as they are providing my main pages as site links. But Google was still unable to do that. Rather than they are showing ten posts as site links, which has been selected randomly. Only about me page was constant. It was a kind of objection to google. 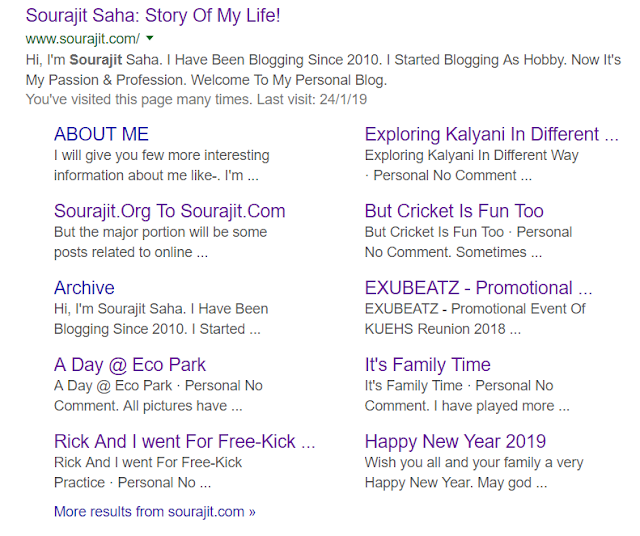 But today when I searched "Sourajit Saha" to check my blog's rank. and i found "About Me", "Contact", "Archive" & "Policy" as a site link which is pretty impressive. Generally, I'm not used to this kind of site links. I have seen somewhere, but I can't recall now. 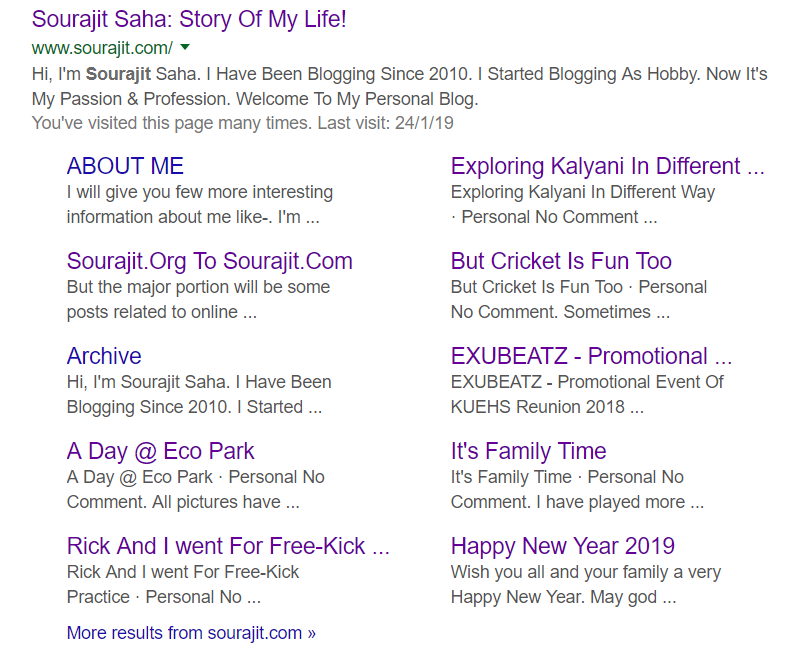 So I was immensely happy after watching it- yeah, google loves my blog. Thank you so so so much google for doing this. At the same time, I was curious about other's blogs. The first blog that stroke my mind is- gatesnotes. 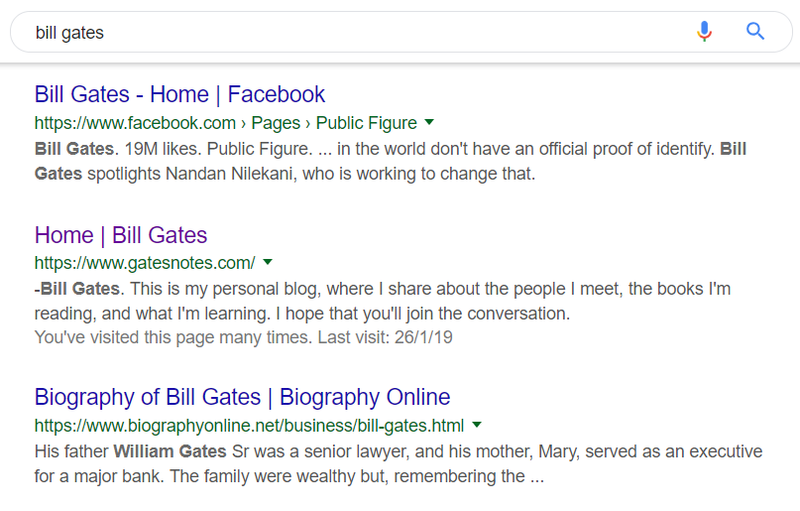 It is bill gates' personal blog and one of my favorite blogs to read. And I was so surprised that even gatesnotes does not have that kind of site links. It's quite surprising. Maybe my posts are able to add value to the search result, that's why I have got this kind of site links. I'm someone, who really loves to write. I can't write 1000-1500 words posts. My maximum posts are like 600-700 words. Whenever I see anything interesting on the web, I try to write my opinion, or about the fact I have learned. I read a lot of articles every day. You can't just white so much without reading anything. I read a line on Humayun Ahmed's book- if you want to write a book, you have to read 100 books. It is something very interesting to me. If I can't gain knowledge, what will I write on my blog? After all at the end of the day, we all bloggers share our experience. People who are always reading about blogging tips, they can write a lot about how to blog. People who love automobile, they can write something on the automobile. Generally, I read most of the times about blogging, so iftiseo, Shoutmeloud, Backlinko, NeilPatel are my favorite blogs. I have learned a lot from them. Iftekhar (owner of iftiseo) is junior to me. Still, I have learned a lot from him. Even personally when I contact him with any issue, he helps me to sort out the problem. So age does not matter at all, experience matters. Now I can feel, I have wasted so many times just for chasing money, and I was less concern about to learn blogging and search engine optimization. A good reading habit is something very important to all bloggers. I was literally a book worm in childhood and early adulthood. But now that habit has vanished. Now I'm much more comfortable reading blogs, websites and eBooks. So it's basically a journey from paper book to ebook. And I'm someone who loves to learn new things every single day. Just like the sky has no limit, know has no limit too. The more you will learn, the more you will be humble and decent. There is a proverb- empty vessels sound much. It's quite true. When I started my first blog- I thought I know everything about blogging. And now at 2019, I can feel I have just learned a few about blogging. It is a vast subject. And you need decades to learn about blogging and search engine optimization. There is a person with less optimization knowledge; he writes the blog every day. He is one of the greatest persons in India, Amitabh Bachchan. And whenever he writes a blog or posts a tweet, he loves to mention the number of that tweet, number of the blog post. It's really unique. He has more than 3500 blog posts. It's not so easy to write a long blog post every day, especially with busy schedules. Still more than 3500 posts. Just take a bow, sir. And one day, I was watching an interview of actor Dev at Zee24Ghanta. At a time, Dev said- if you are doing something good, there is always some people trying to take you down to the ground. It's really true. There are some people, always sarcastic, even if you prove yourself good. It's not the proper term "good" but, when people are praising you for your work, and suddenly you got a sarcastic comment, it's very pathetic. Yeah, definitely I can't make everyone happy, but I try my best to be gentle with people, to be humble with people. Even I comment sarcastically when the topic is sarcasm related. But I never ever hurt anyone through my comment. Well. It's better to stay away from them. Empty vessel sounds much. I don't love noise. Anyway, no more now. If you have any question or query related to this article, feel free to ask me here. Just do drop a comment below the box. And if you find this article share-worthy, then please share it with your friends via Facebook, Messenger, Google Plus, Twitter, Pinterest, WhatsApp etc. Take care.